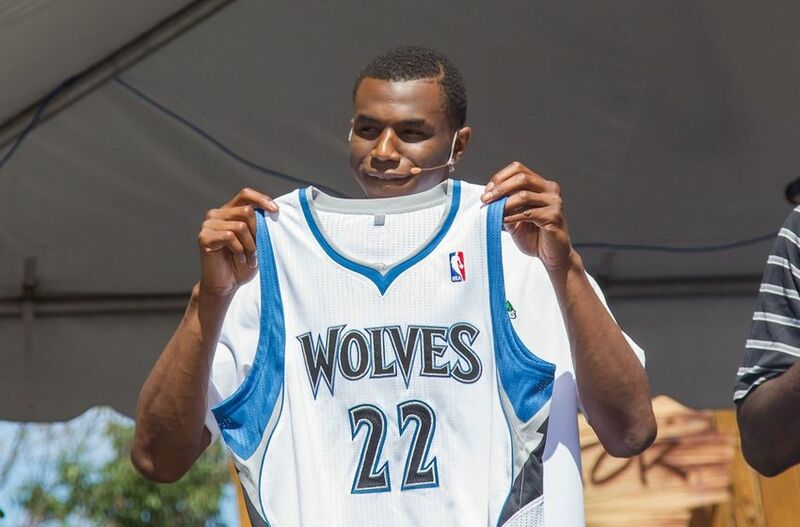 In a close race of unexpected candidates, Andrew Wiggins is the season’s first-half MVP. We’ve hit the season’s halfway mark, so it’s time for a Timberwolves mid-term report. At the quarter mark, I did letter grades for players. For mid-terms, I thought I’d change it up and instead do this with superlatives. Some are good, some are bad, and some are just observations with no serious bearing on wins, losses, or potential. Thaddeus Young was acquired in a trade in which the Wolves sent a future first round pick (Miami’s) to the 76ers. The idea was that he would be a quality veteran forward who — along with Ricky Rubio, Kevin Martin, and Nikola Pekovic — would help the new young players develop in the context of a competitive environment. In theory, it made some sense, even if it was criticized by more than a few writers at the time the trade went down. It has not worked out. Thad is playing some of the worst basketball of his career. His field goal percentage is a career low, at just 43.5 percent. He makes just 60 percent of free throw attempts, and pulls down a measly 5.5 rebounds per 36 minutes (4.8 per game). His PER is the second worst of his career, at a below-average 14.2 and his win shares per 48 minutes are at 0.020, which is way below league averages. He’s often out of position on defense, he’s undersized at power forward but doesn’t shoot well enough from the perimeter to play the small forward effectively, and his decision making with the ball leaves a lot to be desired. Making matters worse is that his backup, Anthony Bennett, has done little to nothing to challenge Young for minutes. Bennett, the top pick in the 2013 NBA Draft, makes too many mistakes to deserve floor time right now. He plays out of necessity and perhaps in the interest of his own development as a potentially-good player, down the road. Bennett shoots a lot of long two-point jumpers, he shows jitters when he tries to do anything off the dribble, he sometimes looks out of shape (though this aspect is much improved from his rookie year in Cleveland) and he has been generally ineffective far more often than not. Bennett has the excuse of inexperience, having played only one college season and being injured and deconditioned for most of his rookie year, surrounded by dysfunction in Cleveland. Sam Mitchell and others have characterized this as his real rookie year. That’s fair, but it is discouraging to see such a disconnect between ability and execution. He has a beautiful jump shot, a bulky-in-a-good-way forward’s body, and shows flashes of supreme athleticism. Yet he usually plays poorly. I think he’s worth a significant, long-term investment but I’d be lying if I said that it wasn’t without risk. He might never “get it.” But in the NBA and much of the modern pro sports world, impatience trumps wisdom and the long view and big picture take a back seat. Perhaps this is one area where Flip Saunders’ GM-Coach combo status can pay off. He doesn’t really answer to anybody but himself, so if he wants to be patient, he can be patient. That doesn’t mean he likes Bennett (I don’t know, and can’t really tell if he does) but it might at least give him some flexibility that less-secure coaches would not feel like they have. We’ll see. In any event, the power forwards have been disappointing. In some ways, I think Robbie Hummel is their best option at the four, which — while I like Hummel more than most — is a damning statement about the other two. Patrick and I have probably been higher on ‘Bazz than most since he was drafted but neither of us would be telling the truth if we said we saw this coming. Muhammad is hurt right now — out with a hip or oblique injury — but when healthy (35 games played) he’s been a pretty awesome scorer. It took Flip a while to trust Shabazz — maybe he was surprised, too — so his playing time is limited right now to just 23 minutes per game. In that time he’s put up 13.7 points on 49 percent field goal shooting, including 41 percent from downtown and a steady supply of aggressive dunks that buck the outdated/alarming trend of mid-range jumpers on this team. Shabazz knows how to score. It’s that simple. It’s what he likes doing and what he does best. When he comes off a pick and catches a pass, his eyes are either on the rim for a potential shot, or on a lane to shoot as if out of a cannon, to the rim. In the post, he establishes position with physicality and continues to show deft touch on that lefty hook shot. He’s not yet a good passer, but he’s a better one that he was in college or as an NBA rookie. He’s improving. He’s been the team’s most pleasant surprise and we all hope he gets healthy soon.